“Can we feed the more than 9 billion people anticipated to live on this planet in 2050 without destroying Earth’s life support systems?” Sylvia Bernstein, author of the recently released book "Aquaponic Gardening, says the answer is a definitive "yes." “Can we feed the more than 9 billion people anticipated to live on this planet in 2050 without destroying Earth’s life support systems?” This captivating conundrum began an October 12, 2011 University of Minnesota press release that became the just released cover article for Nature Magazine’s October 20, 2011 edition titled "Solutions for a Cultivated Planet." The article details the recent findings of an international group of scientists and researchers tasked with nothing less than figuring out how to sustainably secure the world’s future food supply. Sylvia Bernstein, author of "Aquaponic Gardening" and president of The Aquaponic Source points out that the research report fails to mention aquaponics, however. Aquaponics (growing fish and plants together in a recirculating system) is a food-growing approach that addresses the harmful practices cited in the study and simultaneously realizes the potential for increased food production envisioned by the researchers. “Nothing in this report is surprising for anyone engaged in the worldwide ‘future of food’ dialog. However, what I did find striking was that aquaponics was not included among the set of proposed solutions. Widespread adaptation of aquaponics could both alleviate all of the environmental destruction cited by the researchers and provide the vehicle for increased sustainability and productivity.” explained Ms. Bernstein. 4. “About 40% of all crops the planet produces are used to feed animals.” - Fish are the single most efficient converter of feed to flesh of any edible animal. One and a half pounds of feed will bring to harvest, one pound of edible, omnivorous fish fillets. It takes eight pounds of feed to produce the same single pound of beef fillets. The researchers then recommended five changes to current practices that they believe will not only help to solve the issues stated above, but will also extend our ability to feed the burgeoning world’s population. Ms. Bernstein pointed out that all but one can be implemented through aquaponic growing techniques. Please click here to read the full post. The Aquaponic Source is North America’s leading supplier of home aquaponics systems, components, supplies, and educational material. “Aquaponic Gardening: A Step by Step Guide to Growing Fish and Vegetables Together” was published by New Society Publishers and has been the number one best selling Gardening and Horticulture book on Amazon.com. Ms. Bernstein also runs the Aquaponic Gardening Community, which is the largest online aquaponic community outside of Australia. 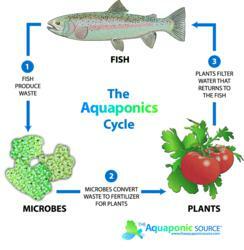 The Aquaponic Source has been in business since 2009 and is based in Boulder, CO.